Well it’s now set, the Super Bowl 42 (looks weird to have normal numbers next to the word Superbowl) rematch. That will be the main story for the next 2 weeks. The Giant underdogs (see what I did there?) upset the 18-0 Patriots to win Super Bowl XLII (ahhh, that’s better). That’s mostly what you will hear for the next 2 weeks. Another storyline that will be beaten to death is that Eli said prior to the season that he believed he was an elite QB before the season…and since then he has more than proved it. Victor Cruz has been an amazing find for the G-men this season but make no mistake, if Alex Smith, Tavaris Jackson or Kevin Kolb is throwing him the ball you likely have yet to discover who the kid is. Eli has been money all season long and he will without a doubt be considered elite if he wins in 2 weeks from now…if he isn’t considered elite already. But the one interesting storyline for me personally will be how pro NY the Indianapolis crowd will be. Now I don’t know how many locals on average attend the Super Bowl. 50%? 40%? That would be my guess, and maybe it’s more, maybe it’s less I honestly don’t know. What I do know is that there will be more locals there than fans from anywhere else. And who do you think the Colt fans will pull for? The brother of there hometown QB, or there biggest rival? 09 was more less a home field advantage for the Steelers vs the Cardinals. It seemed like it was about 70-30 Steeler fans, maybe 80-20. This is a total guess right now but I’m guessing it tops that. Like 85-15/90-10. It will be interesting to see, but the thing to remember of course is that the Super Bowl is over run by coperate America. So it’s not like there is a lot of “Joe Colts fan” at the Super Bowl, even in Indy. However if the Giants front 4 can get to Brady like they did the last Super Bowl then Brady will obviously have trouble and Manning could have his way with the Pats defense. Give them credit though, they have been ok thus far in the playoffs although I’m hesistant to give them too much credit since they have yet to face a QB or offense like the Giants have. It’s going to be a hell of a great game though. Ravens vs 49ers would have gave us the Harbaugh brothers storyline that would have been beaten to death and it likely would have been a boring game. Ravens vs Giants would have also likely been a boring game with very few storylines, although Ray Lewis and Terrell Suggs at media day would have been a must watch. 49ers vs the Pats you would have heard once or twice that Brady was a Niner fan growing up. This has the potential to be the best matchup and how ironic that it will be played in Peyton’s house! Heartbreaking loss tonight for the 49ers. A dream season comes to an end essentially on a fumble. But they are setup for the long haul. Get used to the Niners being back in the elite of the NFC for a long time boys and girls. And the reason will be Jim Harbough. And the reason they were in this game tonight was Jim Harbough…not Alex Smith. After last weekend the media made such a big deal about how great Alex Smith was against the Saints. “He went toe to toe with Drew Brees and won” they said. No. Look at the facts. Saints have a high risk/high reward defense that lives and die’s by the blitz. The 49ers have one of the best O lines in football. Smith got protection in that game and when that happens against the Saints defense just about any NFL QB can pick them apart. It’s similar to Tebow. San Fran has a great TEAM. That gets lost on a lot of fans these days. So many fans (especially the ones 20-30 who have grown up hearing the same things preached) think it’s literally all about wins and loses and if a QB wins then it’s the end all be all. We’ve gone too far the other way now. Back in 01, 02, 03 when Tom Brady was first emerging a lot of the media would say he wasn’t a good QB and it was all about there system. No…it was that Brady made all the right decision’s with the football. He wouldn’t turn it over, he was great in the red zone, etc, etc. Those teams didn’t win solely because Tom Brady was good, but he likely didn’t get as much credit as he deserved (as crazy as that now sounds). So you started hearing Brady apologists say to the Manning apologists “he wins and that’s all that matters”. Which in large part was true. For years a lot of guys that put up huge stats didn’t win. Wasn’t just Manning vs Brady it was Montana vs Marino/Elway, it was Aikman vs Young, and on and on and on. But fast forward to today, and it seems like as soon as a QB wins a game some people (not all) want to ignore EVERYTHING and say “yep, you see this guy is a winner. His teams win”. Well in some cases yes, but more often than not anymore, no. 2 perfect examples this season were the Urban Meyer desciples: Tim Tebow and Alex Smith. The 49ers are so close to winning a Super Bowl. That defense is amazing. There coach is elite. They have some great weapons on offense with Vernon Davis and Michael Crabtree. I doubt they move on a QB this offseason, but they should. If they get the right QB, this group will win a Super Bowl soon. Yes the Pats won, yes Flacco failed in the AFC Championship game for the 2nd time in 4 years. But Flacco did his job today. There are 2 guys if you want to point the fingers: Lee Evans and Billy Cundiff. It always amazes me when people point to Marty Shottenheimer’s postseason record. When Marty was in Cleveland he went to 2 AFC Championship games. The first one was the drive. I don’t hear anyone put that on Marty, they praise John Elway (rightfully so). The next year they went back and Ernest Bynar fumbled on the 2 yard line. The Browns were about to take the lead late in the 87 game and Bynar fumbled. How is that on Marty?! Then in Kansas City he went back with Joe Montana at 38 years old and pretty much nothing else. In 04 he turned the Chargers around and lost to the Jets at home. Kicker Nate Kading missed a FG to win it in OT…a makeable FG. Then in 06 he lost to the Pats at home…with a rookie QB. Anyways, I’ve gone on and on about Marty Shottenheimer. The point is this guy continuously got his teams to overachieve. The reason he kept losing in the playoffs was because his teams realistically were rarely good enough to be where they were. What does all this have to do with Flacco? Well I’m not saying Flacco has nothing to work with or has bad coaching, complete opposite actually. But you watch that game today, Flacco had that team in position to win. Lee Evans got careless with a TD pass that had the Ravens going to the Super Bowl. Then Billy Cundiff missed a kick to put the game into OT. I’m not saying it will happen tomorrow. Tomorrow people will remember the Cundiff miss and Evans being careless. But in 11 months if the Ravens are back in a playoff spot, people will start asking yet again if Joe Flacco (only going into his 5th year and is 5-4 in the playoffs, only 1 of those games at home) can take the Ravens all the way? He proved it today, he can. Don’t forget that when the question comes up again. The plan isn’t to write blogs about my picks, but in this case I have to. I know that’s its highly unlikely that anyone uses these, they’ve been pretty sub par all season. But this weekend was a new low. I really hope on some level that someone did use these, because I would enjoy knowing that someone lost money while I lost my dignity! Wow! You can’t lose that much if you TRIED! Seriously, that’s incredible. Some of these I deserve blame for not thinking the picks through, some I don’t. Start with the Bengals, I deserve blame on this one. I thought a lot of things would cancel each other out and it would come down to rookie QB vs rookie QB. No, the Texans got a much better defense than the Bengals and a much better run game. Add in that they were at home and I should have known better. The Saints and Lions was just the way it sometimes goes. I was right, the Lions stayed in the game. But once the Saints got up 10 the Lions starting trying to play catch up and that’s when the Saints blitzing/ball hawk defense gets you. The Falcons and Giants game was humiliating not just for what I picked (Falcons +3), but for the Falcons in general. That was pathetic. Horrific coaching by Mike Smith, who along with Matt Ryan is now 0-3 in the playoffs. The Giants are good, and have a knack to play up to there competition. But they aren’t THAT good. Just an awful game for the Falcons who have a lot of holes that they will need to address in the draf…oh that’s right, they don’t have a 1st because Julio Jones was going to turn them into the 1989 49ers. And finally Timmy and the Broncos vs the Pittsburgh M.A.S.H. “Oh that’s an excuse, Tebow is god!! !” No, it’s a fact. Just like the Broncos started to decline once they started playing better teams and there defense started getting dinged up. Tebow played great, credit where credit is due. I still don’t budge off my opinion that he isn’t a long term answer. Totally get why everyone pulls for him, I pull for him, but the majority of people that say he will be great have no clue what they’re talking about. But back to the Steelers, say what you want about Roethlisberger, he was a warrior out there today. No Mendenhall, no Pouncy, and only 1 good ankle and he still led them back. As for next week, I will say the Ravens easily dispose of the Texans, the Pats handle the Broncos, the Packers win a tight one against the Giants, and the Saints win a tight one over the Niners. Steelers vs Pats would have given us 3 VERY intriguing games. But it’s not like “Tebow v Brady: the rematch” lacks sizzle, I just think it will be very similar to the last game a month ago. They’re ready to jump off a bridge. It’s all ending. Added to the misery of Canada losing at the World Jr’s in Edmonton is the fact that once again there beloved Oilers are near the bottom of the NHL standings. “Fire Renney! Fire Tambellini!” That’s all you are hearing these days. Whether it’s on message boards or call in shows, all the fans are losing there minds. They have no right to, not yet anyway. You see 2 years ago at this time this fan base was PLEADING for a proper rebuild. Kevin Lowe in particular (as it was still pretty much the team he built at that time) kept trying to build through free agency and trades. They had a garbage farm team in Springfield after years of not even having their own. So every fan was on board for a rebuild and to not just rebuild but do it the right way. Pick a lot at the top of the drat much the way the Penguins, Capitals, Blackhawks and Kings had done. Get an actual AHL farm team and develop players properly, don’t rush them like they had done with Cogliano, Smid, and Gagner. Now here we are 2 years later. The 2nd year of the rebuild. You read that right, the 2nd year. And fans are losing it. Why? Did all of you not understand what you were asking for? Clearly, you didn’t. The Oilers are amassing an incredible group through the draft. Hall, Nugent-Hopkins, Eberle are going to do very special things in Oiler silks. Some fans are giving up on Magnus Paajarvi…he’s 20 years old. Also have Tyler Pitlick, Curtis Hamilton, they will likely deal Sam Gagner at some point but if they don’t he is finally taking a step forward. They also have some very nice defensemen who are still a few years away but they’re coming. Oscar Klefbom was awesome for Sweden at the WJC, David Musil, Martin Marincin, Martin Gernat, Colten Teubert, all these kids look like they could play in the league. None of them look like they will be number 1 defensemen, but a lot of number 1 defensemen don’t look that way when they’re young. They will likely get a 1st round pick once they deal Ales Hemsky. A top 5 pick in this draft at this point looks like it will get them one of Ryan Murray or Matthew Dumba. Both potential number 1 defensemen. With that late 1st they could get for Hemsky they might be able to land there goaltender of the future in Malcom Subban. And that’s assuming they don’t already got it. They’ve picked 3 tendy’s in the last 2 years. 2 of them (Bunz and Tohimma) are having great seasons, and the book on Perhonen was that he would need a lot of seasoning but had the highest upside of any goaltender in last year’s draft. A freak athletically. So Oiler fans….stop freaking out. I get it, the team started off amazing and you all thought that the rebuild was done. Next time don’t be so stupid. It was a hot streak. You all asked for this, you were all on board for this, and you are in prime position to be an elite team in the next few years and stay there for a long time so shut up already. If at this time next season the team is still hanging out near the bottom of the standings, then you have the right to start questioning the coach and the GM. By next season they should start being a top 8 team, but not now. I know it’s been terrible in Edmonton for 6 years now, but it’s only the 2nd year of the rebuild. You’re time is coming soon I promise. Panic in Canada! Alert the elders, something disasterous has happened! How we will recover, I have no clue. 2012 as it turns out really is the end!!! 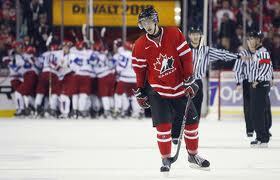 That’s the sense around this country when we lose at the World Juniors. Especially when we lose for the 3rd year in a row, and this time don’t even make the gold medal game. I had 1 friend trying to make the argument right from the get go that this was the worst Team Canada since 1998 (the last time we failed to medal). It wasn’t. It was a team that got quite a few bad bounces in 1 game and came up 1 goal short….perhaps of winning gold. Add to that, Devante Smith-Pelly got injured in the 1st game. I don’t think casual hockey fans have any clue how big of a lose that was. Without Smith-Pelly this team lacked a spark plug. A momentum shifter. An intimidater. This is why I was disappointed with a guy like Brad Ross being left off the team in favor of Tanner Pearson. Full credit to Pearson for forcing his way on to the roster, but I don’t believe for a 4th line role on a hockey team you give it to a guy that brings a subtle game. Ross could have changed that Russian game, Pearson couldn’t. DSP could have changed that game as well, but when you only bring 1 guy like that you leave yourself open to losing that element. 9 other forwards play a similar game to Pearson. Also, something that always is lost upon this country is that if we had our BEST under 20 players, we would win this tournament 9 of 10 years. Remember this: Canada has not lost 1 game in the 2 years they had all hands on deck (95 and 2005). 6 players that are eligible for Canada are in the NHL. Let’s just give us 3, and in fairness give the Swedes there guys (Larsson and Landeskog). Seguin, Nugent-Hopkins and Gudbranson. If we had Seguin and Nugent-Hopkins to go with Scheifele down the middle we would have been SCARY offensively, as if we weren’t already! Gudbranson with Gormley on the top pairing would have flat out owned every teams top line. That means Kuznetsov and Yakupov wouldn’t have run our show the way they did. We would have won with 3 of our 6 guys. I didn’t even give us Jeff Skinner, Ryan Johanson or Sean Couturier who would have made us unbeatable. And please don’t say “well we wouldn’t have had the goaltending”. The goaltending wasn’t phenomenal, but it wasn’t why we lost. Which goal should Wedgewood have stopped? There weren’t weak goals allowed, there were glorious scoring chances allowed. Looking towards next year is tough because you don’t know which guys will end up in the show. Russia could be punished for having 2 elite prospects in Yakupov and Grigorenko. Both could be in the NHL. Yakupov will be for sure. The Swedes could be the heavy favorites. They have a lot of guys that will return, and some high end guys that might be viewed as needing a little more seasoning. Filip Forsberg, Mika Zibanejad, Jonas Brodin, Oscar Klefbom, Victor Rask, Richard Rakell, Sebastian Collberg, and Jeremy Boyce-Rotevall could all return. Then add to it they have kids like Pontus Anberg who will be on the team next year (potential 1st round pick this year). As for Canada…Huberdeau will very likely be in the NHL, and I believe Strome will be as well just cause the Islanders like to rush players. Scheifele I would say is 50/50. If you ask me the Jets should give him another year, but a lot can change from now until September. Boone Jenner should return, but he is a kid that I could see forcing his way on to the Blue Jackets. The big story I see coming up front is Nathan McKinnon being on the team. He COULD be the number 1 centre. Hunter Shinkaruk of the Medicine Hat Tigers is another potentially high 2013 draft pick that could challenge for a spot on what could be a weaker than normal forward group. Scott Harrington will be back on defense and could be joined by Ryan Murphy, Cody Ceci, Matt Dumba, Morgan Reilly, Derrick Pouliot and Griffin Reinhart all will likely be on the team. I can’t see Dougie Hamilton being back, but if he is it would be an incredible addition. Same goes for Ryan Murray, he will be picked high and likely be playing right away for whoever drafts him. I really hope Dumba doesn’t get rushed, but out of these kids he has the potential to be in the NHL. Murphy would be but with Justin Faulk doing a nice job in Carolina that role is filled for the Canes so they can be/should be patient with him. 4 of those 7 are more than suited for the big ice they will be playing on. Needless to say, defense will be our strength. And if we do end up getting Hamilton and Murray back…wow! For the first time since in my opinion 2008, we will have very solid goaltending. Unless someone steps up big, or he falls on his face in the next 11 months, Malcom Subban is the guy that I see being head and shoulders above everyone else for the job next year. We all know how much the Subban boys love the spotlight too. As for who will join him…at this point I have absolutely no cule it’s just way too early to tell. But no matter what happens with the roster, know that we have the best under 20 kids. There is no need to jump off buildings and bridges if we don’t win this tourny. When we don’t win this tourny we usually have 4 or 5 kids in the NHL that could be on the team, many more than other countries. When we do win this tourny, it just shows how far ahead Canada is of everyone else…and we win the under 20’s a lot! Better late than never, although since I’m still in the process getting this website finished beyond what it is and getting the podcast going it really doesn’t make a difference. If people are actually out there using these I apologize…although it’s likely saving you money. I was 2-3 the last 2 weeks I made my picks, only 3-2 the other week. If you are actually using these once again I ask that you don’t bet what you don’t have. Also, Tebow is about as real as the tooth fairy or the Easter Bunny. I’m stunned the Bengals are 4 point dogs. This might end up being a decent game, but make no mistake that the teams that will take the field are not worthy of the playoffs. Houston would be but for just about the entire 2nd half of the season they played without there 3 top players. T.J. Yates has come back down to earth the last few weeks, and the word is that Jake Delhomme is going to be very ready to step in. The Bengals are young, and the Houston defense might give Andy Dalton fits, but at worse I see the Bengals keeping this within 3 points. I think the Bengals will win outright, but you just play it smart and take the points. It’s just too many points. Could I see the Saints blowing out the Lions? Yes. The Lions are inexperienced, while the Saints are dominant at home. But the Lions have gone under the radar the last few weeks with how good they’ve been playing. They will come into New Orleans with absolutely nothing to lose, a swager, they played ok down there a month ago, they SHOULD keep this close. Like I say, it’s just too many points to give up. Everyone seems to be leaning towards the G men. I was leaning that way earlier in the week and believe they have the home field, better pass rush, and better QB. But Atlanta has a better run game which could be huge in this game. Supposed to be brutal weather for this game, and in bad weather games we all know the game plan is to run the ball. Turner could torch the Giants defense. Also, the Giants more than any team in the league let you down just when you think they’re going to turn it on. The Falcons have been building towards the playoffs all season. They’ve done 13-3 and the #1 seed before. This group is 0-2 in playoff games. They got something to prove. I guess I should point out that the Steelers are 9 point favorite’s and will win this game by more than that. I heard some analysts say today they think the Steelers could shut them out. They COULD, but they won’t. Timmy will do something significant. He won’t be as bad as he’s been in the last few weeks. But make no mistake, he will get eaten alive by the Steelers. And I would bet good money Tomlin and the Steelers coaching staff has been looking at Broncos film for quite a few weeks now because the Broncos were really the only team they could be playing on THIS weekend. It was going to be the Broncos or a bye (although the Broncos did all they could to make sure the Steelers played the Raiders). I see this being about a 27-10 game. Roethlisberger isn’t 100% but he plays his best this time of year and with no Brian Dawkins, Von Miller not at 100%, it won’t be as difficult for Big Ben as some might think. Take the 9 points.